Montana is full of wild and rugged terrain, and our search areas are often located miles from developed roads. Occasionally, dog and handler teams will be required to travel via helicopter to access these remote locations. Recently we had the opportunity to complete the SAR Assist Lift Ticket Program with Reach Air Medical Services here in Bozeman. This training taught our dogs and handlers how to safely approach, load, and unload from the REACH Air Medical ship. All dogs are required to wear muzzles for REACH air transportation, and many handlers opt for ear/eye protection as well. Special thanks to REACH Air Medical for allowing us this training opportunity! K9’s Telly, Jake, and Sabre (and their handlers) wait for their turn to load. K9s Yodel, Telly, and Jake (and their handlers) wait for their turn to load. 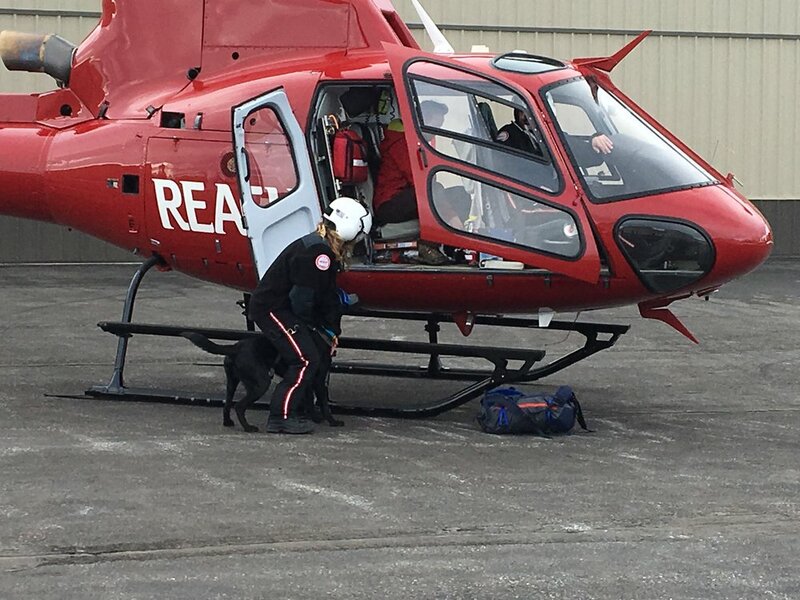 K9 Trigger is a helicopter pro!